On October 10th I, by an absolutely fluke, ran across the teaser for Dischan Media’s Cradle Song. A project going on three years in the making, it has been a labor of love for the founder of Dischan: Jeremy Miller AKA Dani. But, just who is Dani? When will Cradle Song be released and then what can we expect from Dischan afterward, if anything? This month, I’ve brought you the man himself to find out. VNs Now: So here’s what I know about you Dani. A: You’re a Newfie. B: You’ve formed Dischan in 2009. Other than that, what should we know about you? Dani: Well, first of all I’m not a really a Newfie. While I have been in Newfoundland for the past 3 years studying computer science at Memorial, I’m originally from New Brunswick. I spent most of my life growing up in the middle of nowhere. To be very specific about the location of the nowhere: Centre Village. Surprisingly, it’s on Google maps, even though it has a population of maybe 22 people. As for what you should know about me, there isn’t much. I really like achieving things. Goals are my primary motivator in life, but only the ones that are meaningful to me. This should be particularly obvious if you ever get a hold of my GPA. I like drawing, writing, animation, business, and programming (sometimes). I’m only decent at about three of those things, though. I’m sure you can guess which. VNs Now: Take us back to the moment when you decided ‘I want to make a visual novel’. What were you expecting back then from that idea? Has anything changed since then? Dani: I’ve been a writer for quite a while. Before starting Dischan, I actually wrote two (terrible) books which I self published (printed those babies at Staples) and sold to friends, family, and the local bookstore. After finishing my second book I entered a bit of a lull, I tried starting a third every now and then, but it didn’t really click. Then I discovered Katawa Shoujo and gave the demo a play through. Now, putting the actual content of KS aside, I became a bit fascinated by the medium. Visual novels were interesting in that they were actually many other mediums merged into one. They were animation, they were books, they were graphic novels, and they were games (loosely speaking, although some are much more game-like than others). One of the reasons I was kind of failing to get my third book started was because I was growing a bit bored with the limitations of novels. There are some things which you can pull off with the written word better than any other medium, but there are also things which are near impossible to do properly. Backgrounds, character sprites, and music make a huge difference in the things you can do. So, I wanted to make a visual novel. That was now certain. At first I toyed with the idea of making everything myself, but that idea was very short lived. I am a terrible artist, and possibly an even worse musician. So I thought, “what the hey?”, I’ll make some threads around the internet and see if anyone wants to help out. And I did that. Turns out people were interested. Originally, I had my own ideas for the plot. In fact, I had the majority of it planned out. However, when I petitioned for others to join me, I recognised that this could not be ‘my’ project, but would have to be ‘our’ project. So, I laid out my ideas, and discussed them with my newfound comrades (Swiffeh actually came from the first thread I ever made, a thread which he only saw because he was skipping school! Lesson here: Skip school, be cool). Some pieces of my original ideas stuck, and probably a lot more were thrown out. So yeah, that’s pretty much how it went down. VNs Now: I think you mentioned in a panel you did some time ago that you started Dischan with a large group and that was eventually whittled down with time. Currently there are five, including yourself. What has it been like getting to the group you have now? Dani: Uh, well, when you are making random threads, a lot of people tend to join on a whim, but eventually just get bored and disappear. That’s what happened for the majority of the original members. They just slowly faded away. It was quite rare that we had any sort of drama about someone leaving. Every once in a while we would get it in us to recruit, usually after a long line of disappearances, or just because we were in need. People we acquired through those means would usually also quietly disappear. Haha. Thing is, it’s not about the people you lose, it’s about the people you gain. The more people we went through, the higher the chances we’d find someone who has pride in themselves and their work, and the motivation to do great things. Those people are incredibly valuable, I can’t stress that enough. Swiffeh, Doomfest, and Combatplayer all work incredibly hard going above and beyond what could be reasonably expected of them. If you are planning on starting your own development group, you have to find people like this and hold onto them for all their worth. 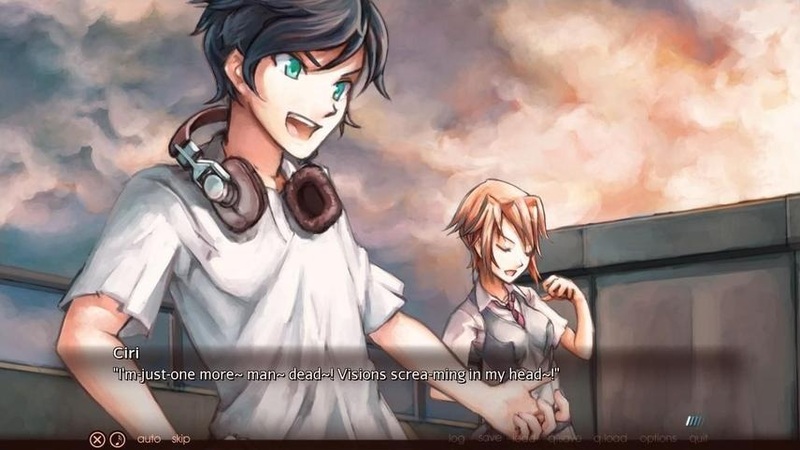 VNs Now: You released a teaser for Cradle Song earlier this year. What can you tell us about how the story has evolved from when you first got your idea to the teaser? Dani: Well, I’d say the biggest change was with *spoilers*, it was originally supposed to be *spoilers*, but we changed it because *spoilers*. VNs Now: Curses! Foiled again! Okay, in the game you play as Nathan Finch: one of the only people in this world not turned into a ‘power user’ in the aftermath of the story’s apocalyptic event. In an era that is determined to make the player feel all-powerful or unique, what led to your decision to make Nathan so normal? Dani: I don’t know if I am technically qualified to answer this question, since it was more a group decision, though I can give you my opinion. To me, I like Nathan as the only powerless escapee because it really underlines his interactions with the other characters. It adds a pretty interesting dynamic to your relationships when suddenly all your friends/acquaintances have the power to blow up your head with their minds, and you are totally helpless. Also, I think you are a bit confused, the apocalyptic event has not actually happened yet. The world they live in is definitely deteriorated, but in the context of the story, this is not caused by the apocalypse. The specifics will become more clear when the real demo is finally out. VNs Now: Clearly sir you are the mysterious type. So what comes next? Will you and Dischan disappear into the clouds once Cradle Song is out or can we expect more from you guys? Dani: We’ll there’s one thing I can say: we love doing this. I love doing this. If I could spend my life running Dischan and make a living, I would. But of course, that’s the thing. Dischan eats up a lot of our time. It’s not so bad right now because most of us are just in school, and that doesn’t usually use up as much time as a full-time job would. I honestly am not entirely sure how things will work out, but we will try to keep going as long as we can, I think. VNs Now: We know you’re planning to release a demo sometime next year. Does that mean that the full game is somewhere around the corner? Dani: … In all honestly, we subscribe to the Valve school of thought in terms of release dates. We won’t release anything unless we are totally happy with it. Also, between classes, exams, work terms, and other commitments, our schedules are pretty variable. It’s hard to tell exactly how much time we’ll have to work on Cradle Song. Sorry, I wish I could give a better answer than that, since I know how it’s much nicer to have a set date to look forward to, but I really can’t say. VNs Now: Dani thank you for your time and good luck with your visual novel. We’re all looking forward to playing it. Dani: No problem! I hope you like it. Follow Dischan’s work on their official wepage and the Cradle Song website!